Three years later Quinn’s house was razed and in its place a handsome stable was erected for William Pearsall. The stable was one of a few that dotted the otherwise residential block. Three stories high, it was clad in buff-colored iron spot brick. A band of rough-cut stone separated the street level from the upper floors, and reappeared as joined sills below the three windows at the second and third floors, and as a string course interrupted by the arched third floor openings. Slightly protruding bricks formed a sort of stylized quoin effect up the sides of the building and an extremely attractive overhanging copper cornice completed the design. The private carriage house coexisted with the homes on the block until November 2, 1912 when it was leased by the Ward Contracting Company. Then, in the 1920s, the church of St. John the Evangelist, around the corner on Waverly Place, began buying up the Perry Street houses. 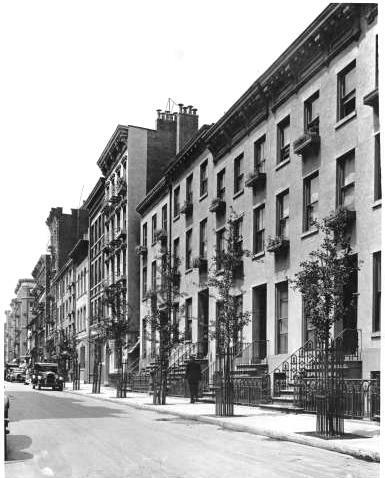 Greenwich Village, by now, had established itself as a haven for artists and poets. The church envisioned an artists’ colony with a communal garden that joined the rear of the church. As the 19th century homes were procured, their rear fences were removed and gradually St. John’s Colony took shape. And when Ward Contracting moved out, reconstructed it was. The stable was adeptly converted into a private home. The street level was refaced in red, Flemish bond brick. The choice of the glaringly dissimilar brick is puzzling, given that the architect carefully matched the brickwork along the sides and reused other elements to retain architectural harmony. The rough-cut lintel over the carriage entrance became the sill of the oversized window and the carved foliate accents reappeared. Inside, diamond-paned casements and a great baronial fireplace gave a Tudoresque feel. If the church intended No. 33 to be part of the St. John’s Colony artists’ group, it did not happen. Maryland-born attorney Leslie Hepburn Buckler moved in with his wife, Elise Fielding Miles Buckler, and their little daughter Eleanor. The well-respected lawyer and army veteran practiced from his office at 80 Wall Street. Suddenly the former stable was the scene of upscale entertaining. Soon the Bucklers would leave No. 33, however. Leslie Hepburn Buckler accepted a position as Professor of Law at the University of Virginia. The reception for Barbara Buckler would be one of the last entertainments. By the end of summer Mrs. Guy Phelps Dodge and her daughters Mary and Rosemary were living here. The girls were of sterling pedigrees. Their late father, who had been president of the American Wood Fireproofing Company, descended from the prestigious Dodge family that included puritan pioneers, millionaires like William Earl Dodge, and their grandfather, the imminent Presbyterian minister Rev. D. Stuart Dodge. Their mother, the former Mary Aborn Rhodes, was descended from John Tilly and John Howland; both of whom arrived on the Mayflower. Another ancestor was Thomas McKean, a signer of the Declaration of Independence, president of the Continental Congress in 1781, chief justice of Pennsylvania in 1786 and Governor of Pennsylvania in 1799. Later that year, in October, Mary Phelps Dodge announced the engagement of Mary Rhodes Dodge to British Naval Lieutenant William P. Sears of the H.M.S. Courageous. The news sparked a new string of entertainments at No. 33 Perry Street. In 1951 the house—still owned by St. John’s--was divided into apartments; one on the first floor, two on the second, and one on the third. Unlike many conversions in mid-century, this one gently modernized the interiors. The great stone fireplace and the leaded glass windows were saved. The apartments were spacious. In 1968 fashion executive Tom Fallon moved in, paying $225 a month. His living room measured approximately 20 x 20 feet and afforded the space to entertain; perhaps a bit differently than Mary Phelps Dodge or Elise Fielding Buckler had done. He once hosted a dinner party for Bill Blass “and his society pals” that spilled out into the large garden. Fallon told The New York Times “I could get a few hundred people in that room,” referring to the living room. In the late 1970s, around the time that Fallon’s apartment was featured in the Home section of The Times, St. John’s began divesting itself of what had been St. John’s Colony. In 1982 architect Carl Pucci purchased No. 33. Before long his extended family was taking over the apartments, and by 2005 when Fallon moved out, only one apartment was not occupied by the Pucci family. The surprising house at No. 33 sits today on a smorgasbord block of Federal and Victorian houses, converted stables and late 19th century apartment houses—a sampling menu of Village history.